And stars which fall to earth never shine again." Here within the calm serenity of the cherry blossoms, we bring you the tale of a warrior. However, this particular warrior was not just any ordinary warrior. He was a Warlord, and yet, he was the first to befriend and aid the Ronins in their quest to destroy Talpa. It is because of this very same quest that he died risking his life to bring another soul who was lost within the darkness of evil where he himself dwelled for many years. 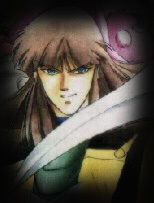 It is because of this that Anubis, The Dark Warlord of Cruelty, shall be forever remembered by both the Ronins, Kayrua, and the other Warlords as not just a person who wore one of the nine armors, but as a friend, a hero... and a true Ronin at heart. Anubis was the soul wearer of the Dark armor of Cruelty, which draws its powers from the contemplation of evil. The colors are dark grey/blue and like all the other Dark Warlord armors, it does not have a symbol. His weapon was a kuwsari-gama, or scythe, with a chain that had a clawed weight at the end. Anubis was born somewhere near Kyoto. His interests revolved around self-improvement, reading, and writing. In short, he was not only a warrior, but a scholar as well. Anubis was also the youngest of the Dark Warlords and was not liked very much by his fellow comrades. Although he was considered as the strongest and the most intelligent of the four, his ego made him seem too hot headed; too quick on actinging than taking the time to think things through. This got him into trouble many of times. For more than 400 years, Anubis walked upon the path of evil and darkness. He followed Talpa's every order with no reguard for those he would hurt. It wasn't till during the fight between Talpa and the Ronins that things began to change for Anubis. He began to question his orders and his loyalty to his dark master, Talpa, and slowly started to rebel. Could he actually be loyal to the wrong master? Seeing that he could still be of some use to him, Talpa used the power of the Neither Spirits to regain his control over Anubis. Luckily, thanks to the help of the Ancient, Talpa's hold on the Warlord of Cruely was broken and Anubis was set free. After having a long talk with the Ancient, Anubis then understood the real truth behind Talpa's intentions. He realized that Talpa was just using him for his armor's powers and that he cared nothing for him at all. 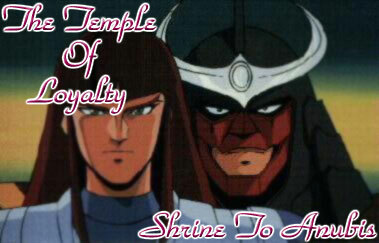 It was then that Anubis dedicated his life to helping the Ronin Warriors defeat Talpa once and for all. It wasn't until Talpa's second return to the mortal world that Anubis also returned. 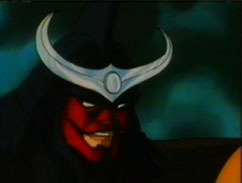 However, he was no longer the evil and hated Warlord that the Ronins knew him as. He had actually become the follwer of the Ancient's ways. Anubis was chosen by the Ancient to carry out his final mission of helping to save the mortal world from Talpa's evil grasp. From then on, Anubis continued his fight against Talpa and is fellow ex-commrads, the Warlords. At the end, he gave up his own life to save Lady Kayrua, thus keeping his vow to the Ancient to bring back the remaining survivor of his klan of the Ancients. Anubis was indeed a true warrior. He may have started his life out as a warrior of darkness and evil, but in the end he fought and died as a brave and great warrior of goodness and light. May your soul find peace among the land of noble warrior spirits, Anubis. You shall be missed, but your heroic tale shall live on forever.